Hyundai Motor Group was once considered to have a more conservative corporate culture compared to other Korean major conglomerates. The group is now undergoing tremendous changes as it becomes nimbler and more flexible in ways of thinking and working. 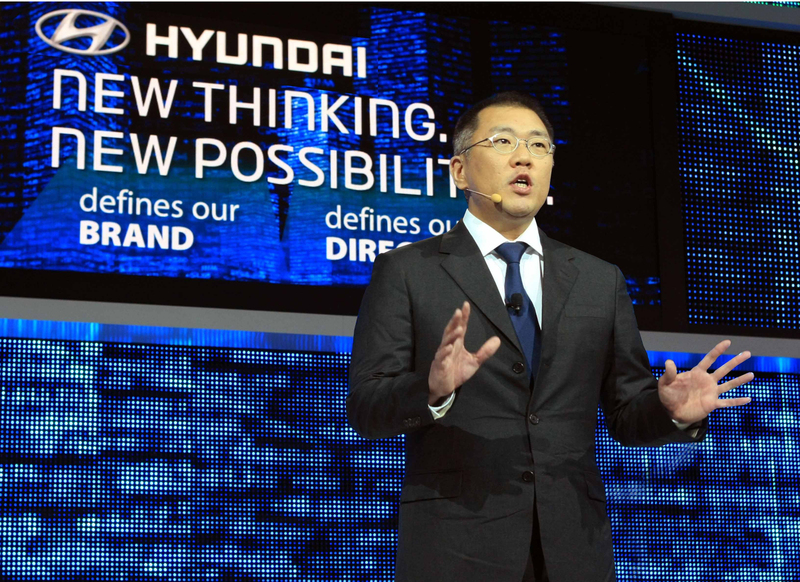 Breaking the conventional mold for creativity is Hyundai Motor Group Executive Vice Chairman Chung Eui-sun. Witnessing in person the transformation of the 2018 International CES in January 2018 in Las Vegas to a venue of competition, Executive Vice Chairman Chung declared, “Hyundai Motor Group needs to be more like ICT company.” He made the remarks while touring pavilions during the CES. “Now that the future of automobiles hinges on the development of digitalization with a focus on self-driving car and eco-friendly cars, so all things, including automakers’ decision-making process and speed, should be changed,” he said. Depending on who will first realize them, he said, it will stand at a crossroads. In reality, the automobile industry is standing at the pinnacle of all manufacturing industries, and the future of the former is forecast to see tremendous change, such as self-driving, the sharing economy and eco-friendly cars. Not only automakers but also electronics companies and ICT companies are venturing into smart, connected cars, and other future car sectors. That was demonstrated by Samsung Electronics’ acquisition of Harman, a global leader in connected car technology, lifestyle audio innovations, design and analytics, cloud services and IoT solutions. In his New Year’s message, Executive Vice Chairman Chung said, “New rules of game, different from the conventional ones, are developing in the wake of likes of the 4th Industrial Revolution.” He was stressing change and innovation in ways of thinking and working. Starting March, Hyundai Motor employees are allowed to wear blue jeans, sneakers or other casual clothes, instead of suits like their counterparts at startups or ICT companies. The move is part of the changes at Hyundai Motor of late under the stewardship of Executive Vice Chairman Chung. The group’s integrated New Year ceremony to kick off the year 2019, the first such event in three years, broke the formalities – all executives sat with the audience with staffers. There were no seats reserved for executives. The event took a presentation format, unlike previous years. At that time, Executive Vice Chairman Chung declared that Hyundai Motor Group was no longer a fast follower in the automobile industry, and it would rise to a game changer to sway the market. Hyundai Motor has introduced a flexible work time in keeping with the implementation of the reduction of the working week to 52 hours. Hyundai Motor employees are given some leeway in when they report for work, a departure from the conventional fixed workday. It is noteworthy that Hyundai Motor’s decision-making, including e-mail reports, is nimbler, breaking long-standing practice of time-consuming hierarchical reporting system. Executive Vice Chairman Chung tends to pursue substance rather than paying attention to ceremonies and formalities, business analysts said. Hyundai Motor Group began to change its long-standing conventional practices since last September when he was promoted to the current executive vice chairman position. In a recent reshuffle of executives, Hyundai Motor Group appointed Ji Young-jo, an executive from Samsung, to head Hyundai Motor’s strategy technology division, promoted Albert Biermann, head of Hyundai Motor & Kia Motors R&D division, to president, and Ahn Dong-il, an executive from Hyundai Steel’s rival POSCO, to Hyundai Steel’s president in charge of production & technology, a newly created job, breaking the mold of pure-blood personnel management. The group became the first conglomerate to abolish regular examinations of recruiting freshmen employees, a practice that was the target of public criticism because of high costs accumulated by examinees, shifting to frequent ones tailored to meet each department’s personnel demand and qualification requirements. Executive Vice Chairman Chung is expected to be charged with more management responsibilities of the group if he will be appointed co-CEO of Hyundai Motor and co-CEO of Hyundai Mobis at annual shareholder’s meeting slated for late March, as planned. He has on his shoulder lots of tasks on how to pull the automaker through exacerbating trade conditions and future uncertainties. Hyundai Motor aims to achieve a 7 percent rate of operating profit and 9 percent return on equity rate by 2022. The automaker’s rate of operating profit plunged to as low as 2.5 percent in 2018. Hyundai Motor rejected US hedge fund Elliott’s demand for a combined 7 trillion won ($6.3 billion) in dividend payout, over three times more than the net profit the automaker earned last year. Industry analysts said Elliott’s demand amounted to an “poison apple offer” that will have an adverse effect on its corporate and shareholders’ values in a middle- and long-term perspective. A view of the Hyundai Nexo fuel cell SUV. On Feb. 27, Hyundai Motor unveiled a blueprint focusing on R&D for the next five years. The automaker announced a plan to channel 45.3 trillion won during the period, 77 percent of which will be spent on R&D outlays. In 2016, Hyundai Motor invested a combined 6.2 trillion won, 55 percent of which was channeled for R&D outlays. The remainder went to facility investments. It indicates Hyundai Motor’s determination to focus on technology rather than facility investments under the stewardship of Executive Vice Chairman Chung. The size of investments Hyundai Motor will make for the next five years – 45 trillion won – is 1.6 times more than 28.5 trillion won the automaker invested for the past five years. The figure of R&D outlays will double from 18.4 trillion won to 35 trillion won. As the automobile industry is entering a transition period on the occasion of the centennial, Hyundai Motor no longer put on hold or reduce investments, officials said. Out of 35 trillion won in R&D outlays for the next five years, Hyundai Motor set aside 14.7 trillion won to invest in future technologies, such as self-driving, mobility and digitalization (or automation). At the same time, the remainder 20.3 trillion won will be channeled into R&D activities related to the expanding of new SUV and Genesis models to enhance the competitiveness of the internal-combustion engine car, the current growth engine. Starting last year, Hyundai Motor began to separate and execute an R&D outlay budget for the new technology category. Last year, the automaker invested 600 billion won in Grab Taxi, a Singapore-based ride sharing company, and other ride-sharing firms in Southeast Asia. This year, Hyundai Motor plans to plunk down 2.4 trillion won in the future technology sector by investing between 2 trillion won and 3 trillion won annually until 2023. Specifically, Hyundai Motor will develop 14 EVs and hydrogen-powered car models as well as platforms for exclusively producing EVs. Investments will be also made in the development of software/road for self-driving, ride-sharing platforms for smart mobility services and data management. Hyundai Motor also revealed a plan to implement a pilot project to operate an unmanned, self-driving taxi, “Robo Taxi” in 2021. Hyundai Motor plans to diversify future car portfolios, including EVs, hydrogen-powered cars, and other eco-friendly cars. Foreign media outlets in Europe and the United States gave rave reviews of Hyundai Motor’s Kona Electric last year. Kona Electric topped a real range test of EVs, conducted by the British automobile magazine What Car. 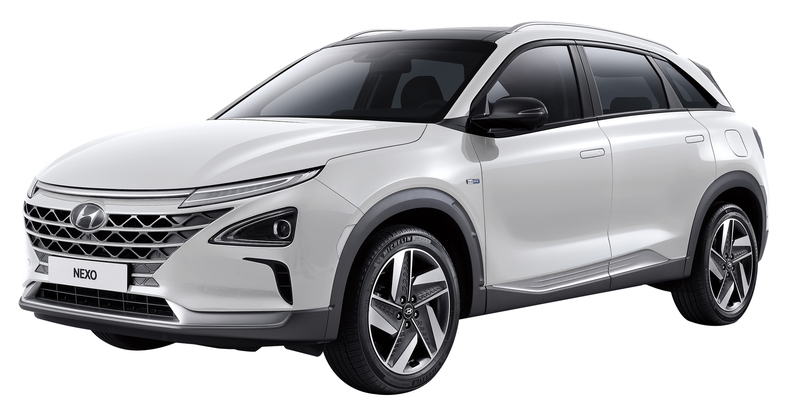 Kona also ranked 2nd side by side with Tesla’s Model 3 and Jaguar’s I-PACE in the North American consumers’ wish list for the 2019 EV cars. Hyundai Motor’s EVs does not much fall behind heavyweight automakers’ counterparts, a Hyundai Motor official said. For instance, Tesla announced the development of Model 3 with a range of 340 km per charging two years ago, but Hyundai Motor’s IONIC, now on the street, has a range of 390 km, he added. 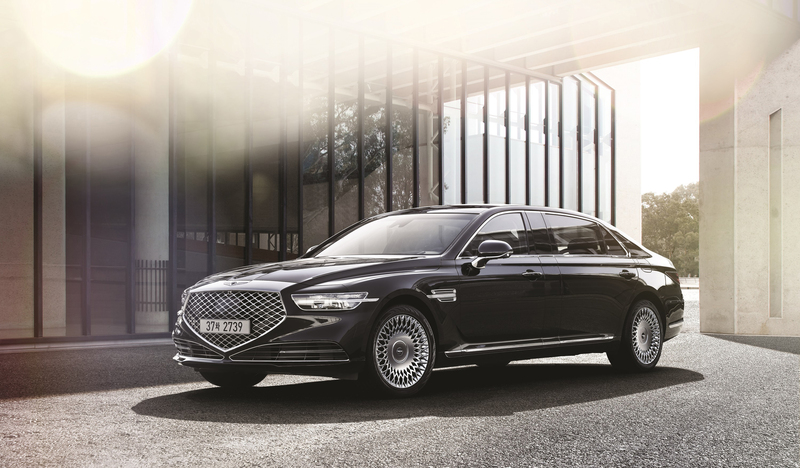 A view of the luxury sedan Genesis G90.